So, what link do I go with today? The flash floods in Port Louis, Mauritius, that were reported on the news tonight, with scenes of torrents of muddy water sweeping through an underpass, helpless people bobbing along on the surface? Cars piled up on top of each other, human chains across roads running waist-deep in churning water, shuttered shops with water halfway up the doors? Eleven dead, apparently - so far: it's a busy and crowded city, of narrow streets choked with stalls, elegant old buildings as well as flimsy ones, a fort on the hill above and fancy new shopping and eating precincts along the waterfront, where beautiful young people pose and preen. Or maybe the Earthflight documentary about birds that I watched tonight? 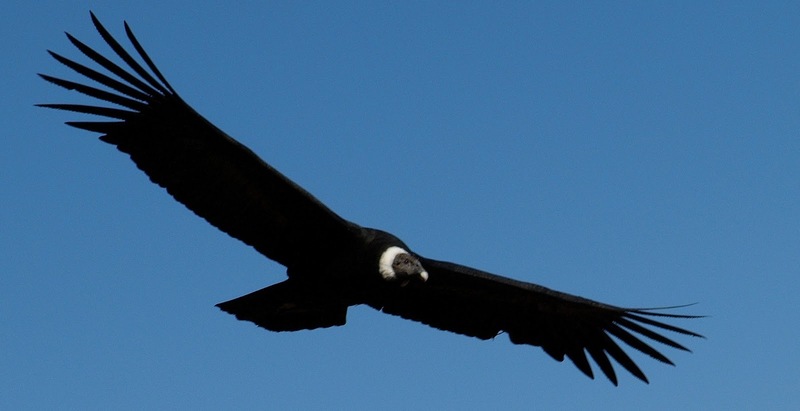 This episode was focused on South America, and featured Andean condors, which I saw spiralling up out of the Colca Canyon; and the vultures that sit hunched on rocks above the incredible roaring maelstrom of Iguassu Falls, apparently impervious to the violence and power of the water all around them; and scarlet macaws clustered on clay lick banks along the Amazon, nibbling the dirt for minerals and to offset the toxic effects of the unripe fruit they eat. When I stood in the jungle, watching them, they circled restlessly and perched in the trees, but didn't land on the clay - something was worrying them, and on the programme I learned it could have been an eagle. Or a jaguar. Perhaps Cotopaxi, which was an answer on QI last night? In Ecuador they claim that it's the world's highest active volcano, and according to Stephen Fry it's higher than Everest - if you're measuring from the centre of the Earth, that is, because the planet is flattened at the poles and bulges at the equator. When I went up to the high paramo for lunch - and delicious canelazo, cinnamon-scented orange tea with rum - at a lodge within sight of the mountain, it was skulking inside cloud and I didn't see it, though the normally more elusive Chimborazo, above, was for once in the clear; but late that night after a long and musical dinner in an Inca-built dining room, on the way to a bath by the fire before bed, Cotopaxi was clear and bright and symmetrical in the moonlight. Or, prompted by the cover picture on a library book brought into the house today, the Glenfinnan Viaduct? It's a graceful concrete curve of 21 arches in western Scotland, build by Robert McAlpine, 'Concrete Bob', in 1901 and still standing strong as the elegant Jacobite train crosses it taking tourists from Fort William to Mallaig - or, in the Harry Potter movies, young witches and wizards to a new term at Hogwarts. I stood knee-deep in wet heather waiting to take a photo of it as it puffed towards me, and regretted, in my cold and soaking jeans, laughing at the Hooray Henry types at breakfast in the hotel that morning in their silly - but actually very sensible - tweed plus-fours. Or I could just stop skiting, and go to bed. Don't implicate me in your piracy shenanigans!